Two industry experts from very different worlds walk you through a Eureka! moment. Get their thoughts on how to build a strong, successful collaborative effort between two distinct disciplines—software testing and user experience (UX) design. Turn to The Last Word, where software professionals who care about quality give you their opinions on hot topics. This month, Linda Hayes details why being able to predict the end state of your data at the beginning of a test is vital to achieving accurate results. 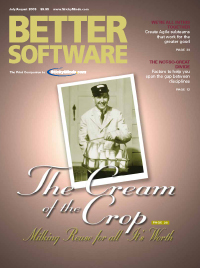 Need to get the scoop on the latest software tests and trends? You've come to the right place. Get one reviewer's opinion of Subversion 1.2. We're pleased to bring you technical editors who are well respected in their fields. Get their take on everything that relates to the industry, technically speaking. In this issue, Mike Cohn discusses the myth of multitasking and how trying to work on too many tasks at once can actually kill productivity. Managing large teams adds up to a headache, especially when it comes to Agile projects. Learn how to successfully divide over-sized teams into Agile subteams—from a practitioner who literally wrote the book on the subject. Building relationships is important because trust allows us to share information more freely. In his article, Jason Yip explains why he'd rather have a face-to-face conversation about bugs instead of relying solely on a traditional bug report. Reuse is one of the rare things in our industry that everyone agrees is necessary. But as an industry, we are pretty bad at it. Welcome to the world of pragmatic software reuse. On your current project, follow the steps outlined in this article to create and deliver truly useful libraries of reusable components. Every manager has a story to tell. Find out how one management professional tackles a fictional dilemma. The story may be made up, but the solutions are tried and true. In this installment, Peter Clark spins a yarn of what can happen when a team member's talent goes to his head. All code is not created equal. Learn from a master of the craft how to spot bad code and mold it into good. This month, Mike Clark explains how writing automated tests can give you confidence to change code fearlessly.